As you can guess, this is for numbers junkies like me. Should your next check-in look like this? Wednesday, my wife had to fly on business, and so (very, very) early that morning, I drove her to the airport, while my daughter slept in the car seat. My wife was also sleeping as I drove us through those pre-dawn hours, so as we approached the airport, I was thinking to myself about the changes in things since 9/11. There were the expected warning signs, that all vehicles were subject to search, that unattended cars or trucks would be immediately towed, and there were a lot of security guards keeping the traffic flowing. But I noticed that crowds of people were standing outside the terminal entrances; a car with a bomb, or even a few gun-toting villains could easily kill a lot of people. I noticed the fences to the tarmac were just simple chain-link fences, with no ditches or barriers to keep anyone from just crashing the gate, or simply cutting the links with a bolt-cutter. There were not even cameras along the perimeter. Access to baggage, fuel trucks, even the planes themselves appeared to be absurdly simple. After dropping my wife off for her flight, I drove my daughter back across town to her daycare, and I though about how little real security had changed. It's not difficult to gain access to water reservoirs, to poisons of myriad varieties and potencies, and even after 9/11, most security improvements are little more than additional uniforms and public announcements. But the fears are ill-founded, because of a basic point of comprehension about the real risk of Terrorism, which Senator Kerry appears to hope the voters will not realize: The risk is determined by where the fight happens, and by who is involved, and by who has the initiative. In his acceptance speech at the Democratic Convention in Boston, John Kerry claimed it was unacceptable for 95% of the cargo ships to enter without being stopped and searched, suggesting that each and every ship had to be searched in order to be safe. At first glance, that sounds ominous. After all, 7500 foreign ships come into U.S. ports each year, with approximately 7.8 million containers (each about the size of the trailer on a tractor-trailer truck). Even if every Coast Guard and Customs agent were to inspect these containers and ships full-time, they could only inspect about 20% of the ships which come in. Worse, Kerry's inspection plan does not even address all the potential risks posed by ships. A terrorist could shut down a major port for months, simply by sinking a ship in one of the many narrow channels they must travel to reach the port. But Kerry is also wrong about the inspection numbers. Richard Bonner, the DHS Commissioner for Customs and Border Protection, explains that "100% of the containers identified as having potential terrorist risk by our targeting efforts are screened through xray and for radiation either abroad or upon arrival in the United States." (testimony to Congress, 3/24/02) Bonner also explained the improvements in processes, tools, and cooperation to get the job done. Basically, the professionals who have already considered this problem for years, have found ways to determine which ships represent risk, and to check out the ships without lengthy delays and exhaustive searches. They also pre-empt threats from attacks on the ships themselves, and in controlling access to the information about ship movements. These improvements have almost all happened while Bush has been President, so naturally Kerry has no intention of acknowledging them. Still, Kerry tells everyone how he wants to fight terror; "Not only a strong military, but renewed alliances, vigorous law enforcement, reliable intelligence, and unremitting effort to shut down the flow of terrorist funds. " OK, let's look at those ideas. 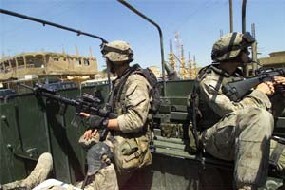 "Renewed Alliances" - In addition to the United States, the following nations have contributed military forces to the effort in Iraq: Albania, Australia, Azerbaijan, Bulgaria, Czech Republic, Denmark, Dominican Rep, El Salvador, Estonia, Georgia, Honduras, Hungary, Italy, Japan, Kazakhstan, South Korea, Latvia, Lithuania, Macedonia, Moldova, Mongolia, Netherlands, New Zealand, Norway, Philippines, Poland, Portugal, Romania, Singapore, Slovakia, Thailand, United Kingdom, and Ukraine. Not included in that tally is Spain, which withdrew its troops from Iraq. The Dominican Republic, Nicaragua and Honduras also removed their troops. The Kingdom of Tonga did, however, deploy 45 Royal Marines in early July to Iraq. With the withdrawal of the Philippines Troops, there are 31 countries militarily participating in the coalition at this time. The alliances Kerry feels we should renew, apparently, are to France and Germany and Russia and China, most of whom appear to have supported Saddam instead of America, because politicians from those nations took bribes from him. For some reason, Kerry has never criticized these nations for this graft, this brutal disregard for the plight of starving Iraqis. Kerry's devotion to things European is also made apparent, by his opposition to moving troops out of West-Central Europe. Kerry wants all the troops to stay in Europe, in order to fight in South Korea and other parts of Asia if necessary, though he did not explain why troops moving closer to Asia would make this harder. Perhaps Kerry's secret allies have warned of a potential vampire uprising, or a werewolf insurgency in the region. Or, Kerry is so far behind in his security briefings, that he is unaware that the Cold War is over. "Vigorous Law Enforcement" - this phrase cuts to the chase of the difference between the Bush and Kerry Doctrines on Terrorism. Bush considers terrorist attacks to be acts of war against America and her people, and accordingly acts to strike the terrorists down, to prevent future attacks. Kerry wants the terrorists arrested and put on trial, which by our standards means Miranda rights, taxpayer-funded legal counsel for the terrorists, and of course the distinct possibility of acquittal on technicalities. I leave the reader to decide which course is more sound, or even sane. "Reliable Intelligence" - This sounds great. We all want to know what's going on in our enemies' minds, and certainly we can all agree that 9/11 showed we were not expecting what happened. But what has been done to make our Intelligence better? President Bush set up the Department of Homeland Security, pushed through the PATRIOT Act (which, by the way, was not passed by Congress to reduce Civil Rights, but to coordinate information, and allow terrorists to be caught with the same tools already used to catch drug smugglers and child predators) , increased funding for Intelligence and National Security, and is enacting most of the measures recommended by the 9/11 Commission. In comparison, John Kerry voted to reduce Intelligence spending (even when other leading Democrats opposed his position), has failed to attend even a quarter of the Senate Intelligence Committee's public meetings, and has a record of voting against essential defense needs. "Unremitting Effort to Shut Down the Flow of Terrorist Funds" - Well,that sounds good, but how do you make that happen? In September, 2001, President Bush announced that the assets of 27 individuals and organizations had been frozen. And the government has been actively pursuing the funding for terrorists for almost three years now. But beyond that, the question of just how to stop money flowing to terrorists has been around for quite awhile. The groups supplying funds are often small, or enjoy protection, such as the United Nations Relief Works Agency (UNRWA). Perhaps Kerry plans to pull the United States out of the UN? If not, one must doubt his sincerity in claiming his efforts really are 'unremitting'. In the case of the 9/11 attacks, money was traced back to Afghanistan and Osama bin Laden pretty quickly, which was one reason the US moved first against the Taliban. It bears mentioning, as well, that Saddam Hussein was a major funding provider for a number of terrorist groups; his removal has caused a cash shortage in the world of the Jihadists. But of course, Kerry wants us to believe it was wrong to go to war in Iraq, yet he will himself be 'unremitting' in his pursuit of terrorists - has the Senator forgotten his schoolboy lessons in Logic? Ah, he must have been in Cambodia at that time. John Kerry's plans, promises, and history are in sharp conflict with one another. It is, therefore, unreasonable to believe that a Kerry Presidency would be productive or successful in the War on Terror. If John Kerry were President, eventually a trip to an airport would take even longer, be more stressful and require more profiling, and would feature a lot more men outfitted like the ones in the picture above this article. As unpleasant as it is, to send young men into harm's way in Afghanistan and Iraq, President Bush has understood that to defeat the enemy, you must strike where it lives. And yes, we are dealing with all our enemies, as we need to do. The proof of that lies in the fact that I can still take my wife to and from the airport, get my daughter to and from the daycare, and drive to and from work, all in the same day, and in the confidence that my government is protecting us as well as is humanly possible, by fighting the enemy in places like Najaf, instead of Houston. Worth Your Vote? Probably not. Worth your respect? ABSOLUTELY. People who know me, already understand that I am a completely satisfied supporter for President Bush, and so there is absolutely zero chance that I would vote for anyone else. But as the election approaches, it does strike me to show gratitude to people who prove the system works. Most of us don’t realize all the options we have in the race, much less the hard work and dedication these candidates and their teams put in. For this article, I leave the noise and glitter of the major parties, and turn to a brief look at what it takes for a regular citizen to think about running for the White House. If you’d like to run for President of the United States, you start with the Constitutional requirements (Article 2, Section 1, also Amendment 12); Natural born citizens, at least 35 years old, must have resided within the United States for at least 14 years. And, of course you have to have a group which thinks you should run, someone who has formed a political party. These are the BASIC forms. Additional forms may be necessary in certain conditions, and there are additional forms which must be filled out at the conclusion of the campaign, win or lose. Now, you’re ready to start campaigning in each state. A Certificate of Write-In Candidacy for President of the United States in the General Election. OK, if you've done all that, now you're ready to BEGIN your campaign. Somehow, you've got to raise visibility for your campaign, get people familiar with your name. If you're a Democrat or a Republican, that just means having your campaign contact a TV station for a few interviews to get your face on the air. For anyone else, you'll need to have money and be really, really persuasive. After all, when's the last time you saw a commercial from the Reform Party, let alone the Prohibition Party or the Socialist Pary USA? You'll need to fight for your chance to be heard at the grassroots level, which is the only level where you can avoid getting smothered by the mainstream parties. You'll have to face the automatic derision of people who assume you are a nutcase, simply because you don't support one of the two big parties. ou'll have to somehow be different yet reasonable, get attention but not scare away the average guy, and you'll have to overcome the pre-conceptions of nearly everyone you meet. Over and over again, day after day after day, until you contemplate suicide, or worse, closing the campaign. Yet, over the history of the United States, these little groups change history without ever getting credit for it. For instance, there was an Abolitionist Party in the United States in the mid-Nineteenth Century, but it never took hold. But the new Republican Party saw the value in opposing Slavery, and Lincoln rode to the White House on the platform built from the ideas which included the Abolitionists. Franklin Roosevelt was not shy to take ideas from the Republicans, the Socialists, even the Communist Party (with apropriate revisions), in order to build and advance the New Deal. The Republicans today, and the Democrats, have learned to be keenly aware of the public mood, and if one of the minor parties comes up with an effective strategy or concept, count on the big boys to pick up on it and incorporate it into their own plans. Jay Leno once quipped, that in a Presidential Election you only get 2 choices, but in Miss America you get 50. Mr. Leno is wrong. Like most Americans, he missed the quiet but vital contributions of the minor-party candidates. As an endnote, I should mention that these thirteen do not, even now, complete the list of people running for President. Since this time last year, over thirty people have declared their candidacy, though some have dropped out of the race, and others have just dropped off the map. But whether or not you or I would ever vote for them, we should be thankful for their work and energy. America is better for it. Well, here we are in the middle of August, and the race is still in doubt. But the race has gone on long enough, that there is a real shape and direction to it, as well as some interesting roadmarks. I apologize for the cluttered look of the graph above; I'm still trying to find a way to import a graph or chart into a blog, which will not become too busy to work. I have some very nice graphs charting a number of other races in several categories, which I couldn't use because the scale flat-out disappeared in a blog. This chart has four lines to track. 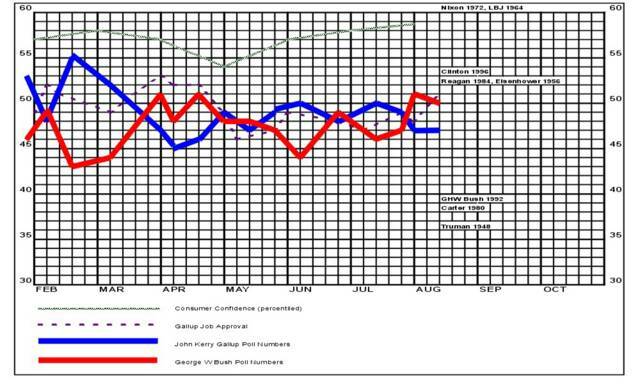 The blue line is how Gallup tracked Kerry's poll numbers since February, and the red line is President Bush. Note the back and forth between them. Note also, that neither has been below the mid-40s, nor much above 50%, except for a brief honeymoon for Kerry when he became the Democrats' front-runner. If you think I am unfairly discounting Kerry's high numbers, bear in mind that I did not go back to December 2003, when Saddam had just been caught, and Bush's poll numbers looked like NASA telemmetry. 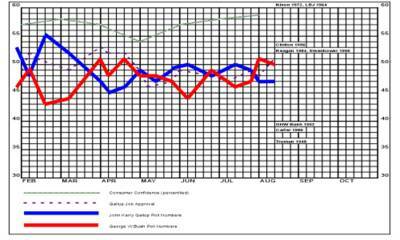 The other two lines are what I consider relevant influences; the purple dotted line is Gallup's Job Approval, and the green line is Consumer Confidence Sentiment from the University of Michigan, which I converted to percentile form (based on CC numbers since 1978). These two factors are traditional indicators of the health or lack in a President's bid for re-election, and bear closer comparison to actual election results than any other factors I have been able to chart consistently in election campaigns. If you look closely at the chart, you will observe that I have noted the mid-August positions of the eight previous incumbent Presidents. It's interesting to note, that the mid-August positions of Nixon and LBJ are literally off-the-chart compared to now; those races were obviously over by this point. But Clinton, Reagan, and Eisenhower were only a couple or three points better than President Bush is right now. Now, I know there are other polls which say otherwise, but the reason I use Gallup for this comparison, is that most of these other polls did not exist when Reagan was running, let alone Nixon, LBJ, or Eisenhower. Also, if you look at the low end, you will see that Carter, Ford and GHW Bush were running below 40% at this time. While Harry Truman was at 37% in mid-August and came back to win, the obvious lesson now, is that President Bush is running about 11 points better than his father was at this point, so it's only reasonable to say that Dubya is in much better shape. Further, since Truman has come back from 37% at this point, but no one at 50% or better at this point in both Job Approval and Poll standing has ever failed to win re-election (and that threshhold really starts around 45% if you want to fairly draw the line between those who do win and those who don't), it's really reasonable to say that President Bush has a much better advantage than first glance may suggest. My previous article on this subject detailed Gallup's accuracy in aggregate, so it's worth noting that Gallup has been off by as much as 12 points aggregate, but has often been tantalizingly close. Gallup has been within 3 aggregate points the last three elections, and seven of the last nine. Again, I acknowledge that other polls give Kerry the lead, some by as much as 7 points, but their track records are short, and the most substantial trends support the President, especially when the calendar of events between now and November are considered.